… and he still NEVER stops talking about her. I said Get a new pretend girlfriend Uncle Ned, Wonder Woman hasn’t been on the air for 10 years or more. He said OK I’ll take Cindy Crawford, and I said You’re a little late, she just married Richard Gere. So he said Then I’m going back to Wonder Woman. 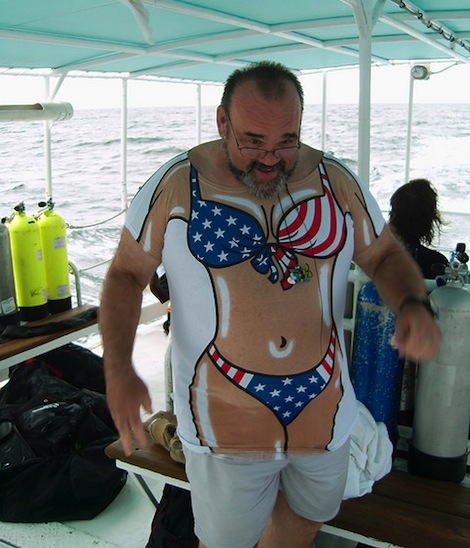 Last Christmas, when he told Pat and me he was taking us on this vacation to the Bahamas for spring break, we got him this funny T-shirt that will remind him of Wonder Woman a little bit. We made him wear it today, and it’s even funnier than we expected. I said Pat should we feel guilty about all the razzing he’s taking by the other tourists on this boat? but Pat said No, he loves it, and he’s getting a lot of attention. Pat thinks we get to go on these free vacations every year because we always land Uncle Ned in some fun situations.